Being able to broadcast data in real-time from servers to clients is a requirement for many modern web and mobile applications. Creating an UI reacting in live to changes made by other users (e.g. a user changes the data currently browsed by several other users, all UIs are instantly updated), notifying the user when an asynchronous job has been completed or creating chat applications are among the typical use cases requiring "push" capabilities. Symfony provides a straightforward component, built on top of the Mercure protocol, specifically designed for this class of use cases. Mercure is an open protocol designed from the ground to publish updates from server to clients. It is a modern and efficient alternative to timer-based polling and to WebSocket. Because it is built on top Server-Sent Events (SSE), Mercure is supported out of the box in most modern browsers (Edge and IE require a polyfill) and has high-level implementations in many programming languages. Mercure comes with an authorization mechanism, automatic re-connection in case of network issues with retrieving of lost updates, "connection-less" push for smartphones and auto-discoverability (a supported client can automatically discover and subscribe to updates of a given resource thanks to a specific HTTP header). All these features are supported in the Symfony integration. Unlike WebSocket, which is only compatible with HTTP 1.x, Mercure leverages the multiplexing capabilities provided by HTTP/2 and HTTP/3 (but also supports older versions of HTTP). In this recording you can see how a Symfony web API leverages Mercure and API Platform to update in live a React app and a mobile app (React Native) generated using the API Platform client generator. 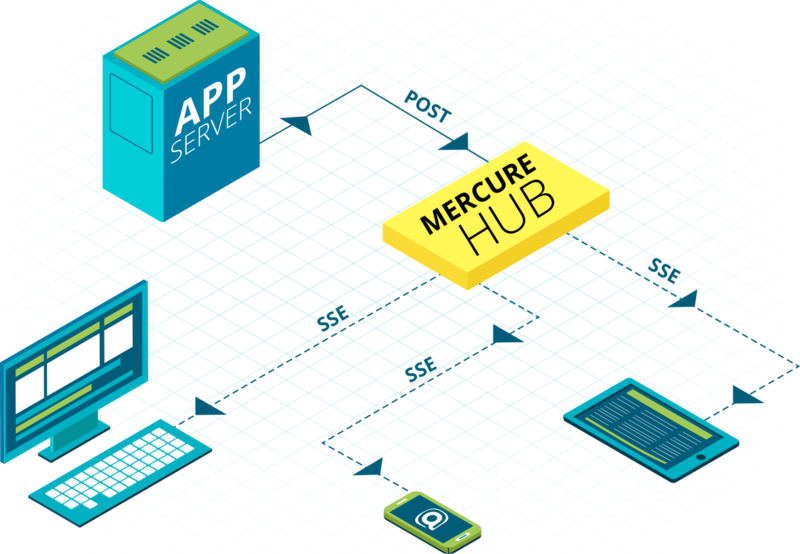 To manage persistent connections, Mercure relies on a Hub: a dedicated server that handles persistent SSE connections with the clients. The Symfony app publishes the updates to the hub, that will broadcast them to clients. An official and open source (AGPL) implementation of a Hub can be downloaded as a static binary from Mercure.rocks. Alternatively to the binary, a Docker image, a Helm chart for Kubernetes and a managed, High Availability Hub are also provided by Mercure.rocks. The API Platform distribution comes with a Docker Compose configuration as well as a Helm chart for Kubernetes that are 100% compatible with Symfony, and contain a Mercure hub. You can copy them in your project, even if you don't use API Platform. The preferred way to configure the MercureBundle is using environment variables. Set the URL of your hub as the value of the MERCURE_PUBLISH_URL env var. The .env file of your project has been updated by the Flex recipe to provide example values. Set it to the URL of the Mercure Hub (http://localhost:3000/hub by default). In addition, the Symfony application must bear a JSON Web Token (JWT) to the Mercure Hub to be authorized to publish updates. This JWT should be stored in the MERCURE_JWT_SECRET environment variable. Because the array is empty, the Symfony app will only be authorized to publish public updates (see the authorization section for further information). The jwt.io website is a convenient way to create and sign JWTs. Checkout this example JWT, that grants publishing rights for all targets (notice the star in the array). Don't forget to set your secret key properly in the bottom of the right panel of the form! Don't put the secret key in MERCURE_JWT_SECRET, it will not work! This environment variable must contain a JWT, signed with the secret key. Also, be sure to keep both the secret key and the JWTs... secrets! The Mercure Component provides an Update value object representing the update to publish. It also provides a Publisher service to dispatch updates to the Hub. The first parameter to pass to the Update constructor is the topic being updated. This topic should be an IRI (Internationalized Resource Identifier, RFC 3987): a unique identifier of the resource being dispatched. Usually, this parameter contains the original URL of the resource transmitted to the client, but it can be any valid IRI, it doesn't have to be an URL that exists (similarly to XML namespaces). The second parameter of the constructor is the content of the update. It can be anything, stored in any format. However, serializing the resource in a hypermedia format such as JSON-LD, Atom, HTML or XML is recommended. click on the "EventStream" sub-tab. Instead of calling the Publisher service directly, you can also let Symfony dispatching the updates asynchronously thanks to the provided integration with the Messenger component. First, be sure to install the Messenger component and to configure properly a transport (if you don't, the handler will be called synchronously). The Mercure protocol comes with a discovery mechanism. To leverage it, the Symfony application must expose the URL of the Mercure Hub in a Link HTTP header. fetch('/books/1') // Has Link: <http://localhost:3000/hub>; rel="mercure"
To subscribe to private updates, subscribers must provide a JWT containing at least one target marking the update to the Hub. To provide this JWT, the subscriber can use a cookie, or a Authorization HTTP header. Cookies are automatically sent by the browsers when opening an EventSource connection. They are the most secure and preferred way when the client is a web browser. If the client is not a web browser, then using an authorization header is the way to go. In the following example controller, the generated cookie contains a JWT, itself containing the appropriate targets. This cookie will be automatically sent by the web browser when connecting to the Hub. Then, the Hub will verify the validity of the provided JWT, and extract the targets from it. To use the cookie authentication method, the Symfony app and the Hub must be served from the same domain (can be different sub-domains). This method is especially convenient when using tokens having an expiration date, that can be refreshed programmatically. When creating a web API, it's convenient to be able to instantly push new versions of the resources to all connected devices, and to update their views. API Platform can use the Mercure Component to dispatch updates automatically, every time an API resource is created, modified or deleted. As showcased in this recording, the API Platform Client Generator also allows to scaffold complete React and React Native applications from this API. These applications will render the content of Mercure updates in real-time. Checkout the dedicated API Platform documentation to learn more about its Mercure support.